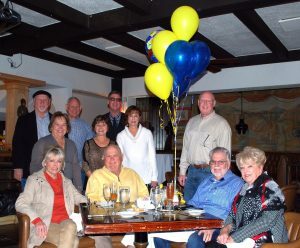 The Kiwanis Club of Tulare will present its 58th Farmer of the Year award to Corky and Doug Anderson. The award luncheon will be held Tuesday, March 20, 2018 at 12pm at the Heritage Complex in Tulare. Tickets are available for $25 in advance from Kiwanis Club members and various businesses in Tulare, tickets will be $30 at the door. This year’s honorees are brothers, Corky and Doug Anderson. Corky and Doug were raised near Waukena, outside of Tulare where their father and grandfather were also farmers. At age 13, Corky and a cousin started hauling hay for local farms and by 14 his business was successful enough to put a payment down on a new car. Corky began doing specialty work in sugar beets, and then in cotton and grain. Doug also knew he was destined for the life a farmer, and wanted to be the third generation to farm their home place west of Tulare. Corky moved to Orland for a time where he leased land and farmed row crops. He was a leader in the pistachio industry, creating a partnership in 1968 to form Pioneer Nursery, which specialized in selling pistachio rootstock they developed that was resistant to a devastating fungal disease called Verticillium wilt. The nursery was moved to Delano, and in 1982 Corky and his partner pioneered a new combination of rootstock naming it Pioneer Gold. Corky has been a member of the Western Pistachio Association since its beginning in 1989, served as Vice-Chair and Secretary/Treasurer, and numerous committees. He has served on the California Pistachio Commission, and Marketing Chairman from 1984-1989. A tireless advocate for the industry on government relations, tariff and trade, marketing, public relations, board governance and leadership. He has been instrumental in fundraising for the Pistachio Political Action Committee, one of the most successful agricultural PACs. Doug started farming full time in 1972, with his father Hank, who at the time had 3,000 acres of row crops in Lost Hills and 640 acres west of Tulare. Hank Anderson passed in 1980 and Doug took over the full operation, and brought his sister Debi and brother Corky into the picture in 1997 forming AMA Pistachio Farming and AMA Properties. Doug also co-founded Precision Ag Spraying. He served as a volunteer for the Waukena Fire Department for 10 years. He has volunteered for 20 years for the Hank Anderson Memorial Golf Tournament, which benefits local schools and hospitals. In the 1990s Doug also acquired his real estate license, and established his own agency in 2005. He has been involved in APA, PGI, and WPA. In 2008 he along with other growers formed the Horizon Co-Op to market their pistachios. Doug is member of the downtown Tulare Association and a member of the Tulare Chamber of Commerce, Elks Lodge, and Roma Lodge. Doug also possesses a pilot’s license he acquired in 1976 and enjoys volunteering at the Farm Show from time to time and for his church. Tickets are available at Farm Credit West, Garton Tractor and Machado Hay in Tulare. For information contact Celeste Moore, event chair at (559) 280-1481.